During this session, you will learn how to read and produce mind maps. You will learn the technique to build a map from start to finish and explore how to enhance your map for memory and learning purposes. You will also learn how to do quick-think maps which will be of benefit in the work environment. This session focuses on how to use mind maps to brainstorm new ideas, make decisions, plan and prioritise, solve problems, take notes in meetings, make notes from printed materials, prepare and present information. You will create several mind maps to enable you to practice your new skills. This session gives you the opportunity to work on your own mind mapping project e.g., brainstorming new ideas, planning a project etc. You will create your own mind map(s) from materials you personally bring to the workshop e.g., reports, documents, books, newspapers and magazines, creative briefs, project briefs. Sorry not to have said anything other than ‘Excellent’ but it was the best training day I have ever done – primarily due to the genuinely practical nature of the content. We had a really good day and it seemed to get everyone engaged. I particularly liked how we can apply mind-mapping to our work straight away. In fact, Lesley has spent the last 2 days doing mind-map to help with planning her projects already! Does it include software training? No. 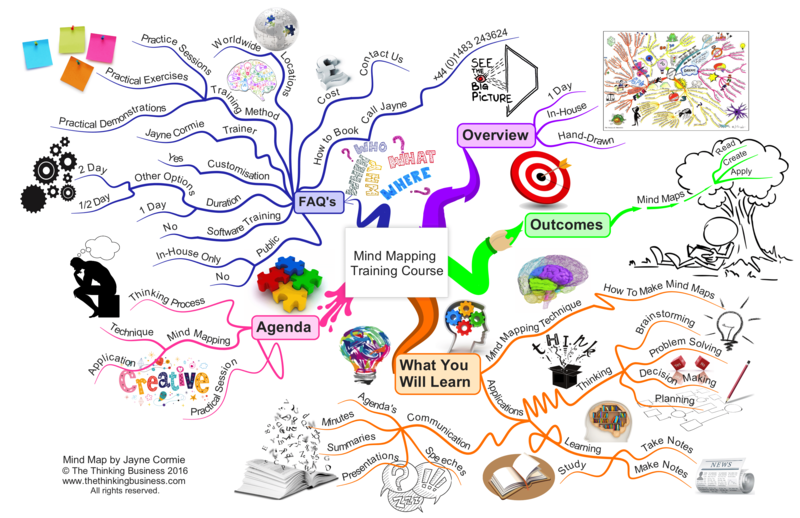 This course focuses on the creation of hand-drawn mind maps. However, Jayne will recommend mind mapping software and show sample mind maps using this software. Jayne is an expert mind mapper and was trained by and has co-trained with Tony Buzan – the inventor of mind mapping. Anyone who wants to think smarter, learn faster and communicate better. All management levels benefit from learning and using the mind mapping technique.